The common name, western wallflower, comes from the plant's distribution and an European connection. The western wallflower occurs in the western and central portions of the United States. In Utah, this plant represents the greatest ecological latitude for any Utah plant, occurring from two thousand two hundred and eighty feet to eleven thousand four hundred feet. The wallflower portion of the common name is taken from a relative that grows against stone walls in Europe. Perhaps this is where the term "wallflower" originates, suggesting a shy and timid person who stands against a wall, waiting to be included in an activity. 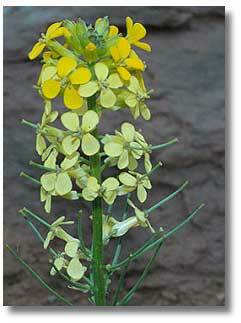 The generic name Erysimum (e-ri-si-MUM) comes from the Greek word erysimon meaning "biennial and perennial herbs." The species name asperum (a-SPE-rum) means "rough" and refers to the texture of the leaves. Some authors call the plant rough wallflower. The family name Brassicaceae is sometimes called the Cruciferae meaning "cross" and this refers to the pattern of the petals and the stamens which are in the shape of a cross. The western wallflower occurs from the Yukon Territory south to California and Arizona and eastward to Oklahoma, Kansas and Minnesota. The western wallflower grows in low elevation shrublands, mountain brush, pinyon-juniper, ponderosa pine, aspen, Douglas fir, and spruce-fir to alpine communities. It grows in a variety of soil types. Biennial or short-lived perennial. Often a single stem arises from a basal cluster of leaves. The stems grow from five to forty inches long. Basal leaves are one to five inches long and are elliptical or spatula-shaped in outline. Stem leaves are smaller towards the top of the stem. Both the stem and the leaves have tiny "Y" or pick-shaped hairs, called malpigian hairs. The hairs are attached at their middle to the stem or leaf. Dense clusters of yellow flowers occur at the top of the plant and have four petals and six stamens which are arranged in a "cross" pattern. Occasionally, some flowers have an orange tint or may be completely orange. Flowers are about one half inch across. The fruits that form are called silicles, long narrow pods that are one to five inches long and contain small, black seeds. The flowers of the wallflower have an aroma that is slightly sweet with a touch of ammonia. This attracts short-tongued insects, such as flies and some smaller bees. Western wallflowers may grow singly or in large patches. The plants bloom early in the season in Arches National Park, but may be found blooming in the mountains later in the summer. The "juice" or cytoplasm of mustard plants is very watery and pungent and contains a glycoside, that is hydrolyzed to form oil of mustard. We have an online wildflower field guide that is designed to help you identify desert wildflowers by color, scientific name, region and common name. The pictures are sized to work on the iPod, iPhone. iPad and similar devices. 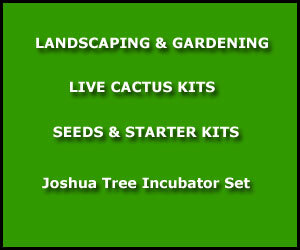 With your iPod or phone you will easily be able to identify wildflowers while in the desert. Links for downloads are on the bottom of the Wildflower Field Guide page. Newsletter -- Each month we send articles on hiking, camping and places to explore. Animals, wildflower reports, plant information and much more. Sign up now (It's Free).